For my first K-FORCE review, I'll just go with the basic offering, the Mini Cross. It's an 82-piece building set, with five darts included. There are instructions for building it, just like any other construction set. I took maybe ten minutes to assemble the blaster, but assembly times will vary. Now for a few pieces in need of highlighting! First, the trigger. It has several unique pieces, including a black reinforcement piece for the rod underneath, and a few tiny pieces that are 1:2 scale to normal K'NEX pieces. DO NOT LOSE THESE TINY PIECES. They are inserted into the back of the plunger assembly and raise the catch. Then we have the plunger assembly, one of the few parts not manufactured here in the United States (along with the snap-on priming ring and the grip). 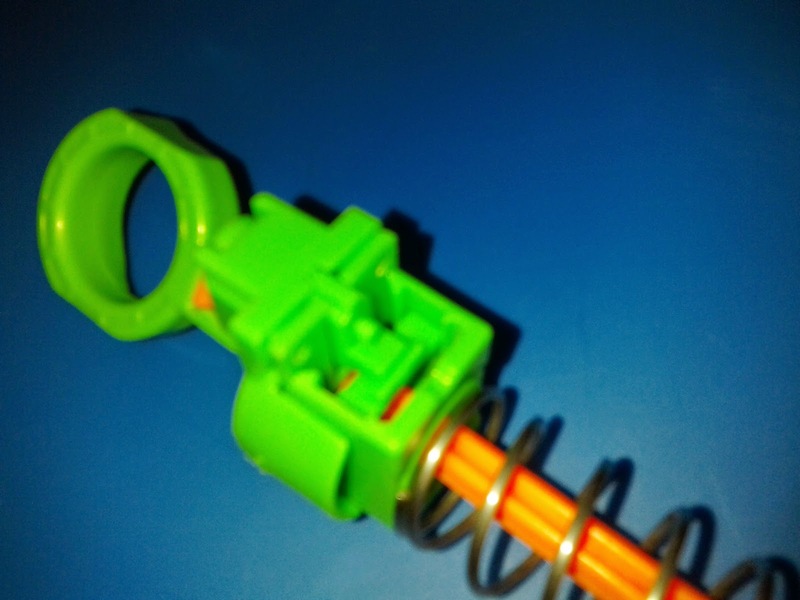 The green casing holds a white plunger tube within, measuring 25mm inner diameter, while the plunger draw is 40mm. So the volume inside is decent. 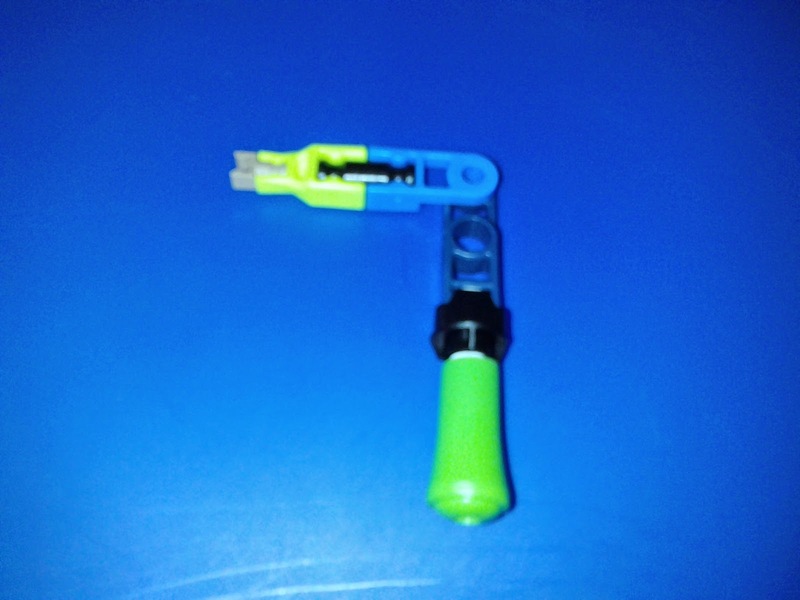 Four screws hold the plunger assembly together. 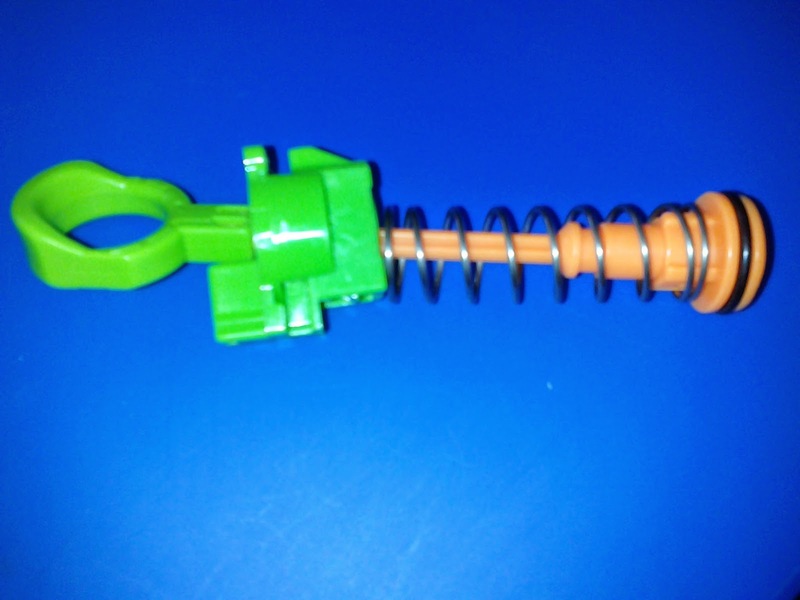 With the plunger removed, you can see the small diameter spring, along with the unidirectional catch on the plunger rod. 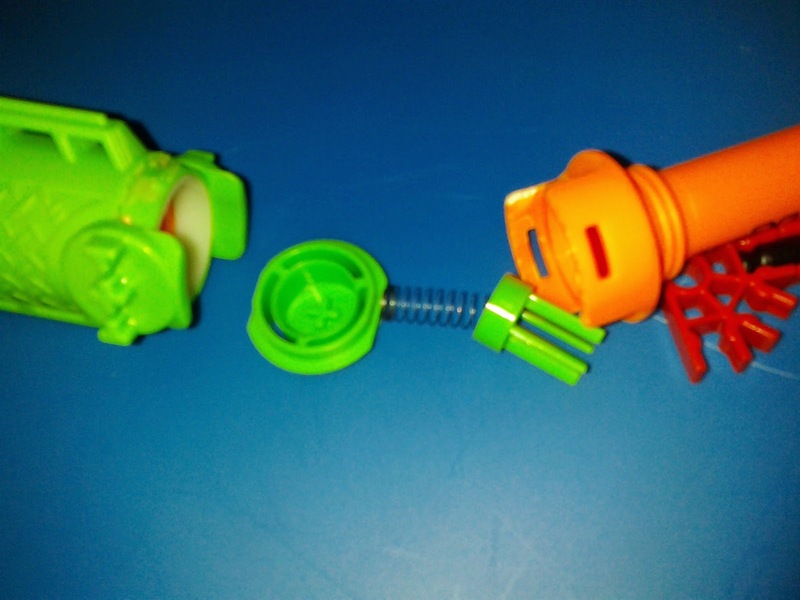 If you unsnap the priming ring, you can isolate the plunger completely, making it easy to swap or add springs. This shot shows the catch assembly. Now for basic modding. We know how to change the plunger setup. Now for the barrel! You'll need a miniature regular screwdriver, with as thin an edge as you can find.Using that, you can wedge it between the barrel and the casing. Gently wiggle back and forth to sever the light adhesive bond between the plastic pieces, then lift the orange "wings" over the green tabs holding them in place. Now you can see the air restrictor! There is also a green plate at the front of the plunger tube. If you're removing the AR, you can go ahead and punch out the middle of the plate before putting it back. Removing it completely would leave a gap for air to leak out. 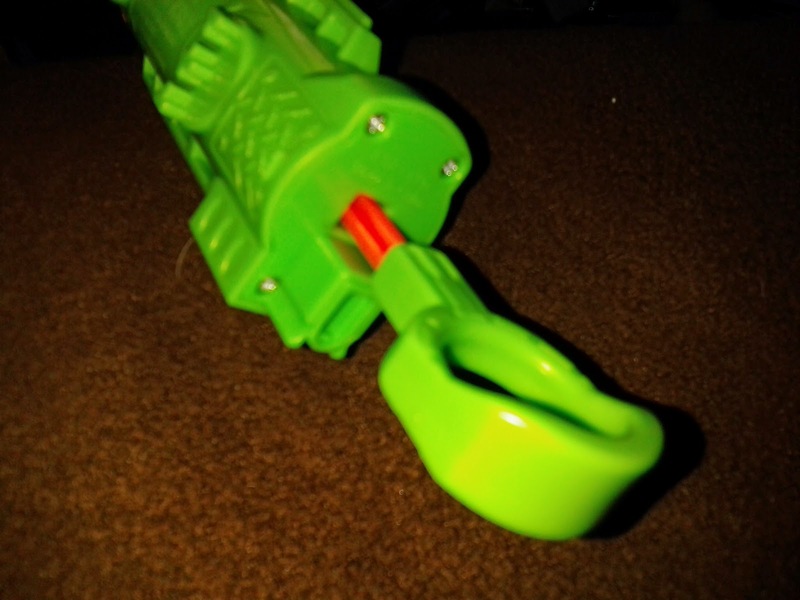 EDIT: You can also separate the dart peg and the barrel. It's easiest to just drill out the dart peg with a 9/16" drill bit. Put the piece back afterward to maintain your seal. Finally, we have the darts. The ones included in my package were identical in length to Nerf Elite streamlines, and weighed in at just under 1.1g each. 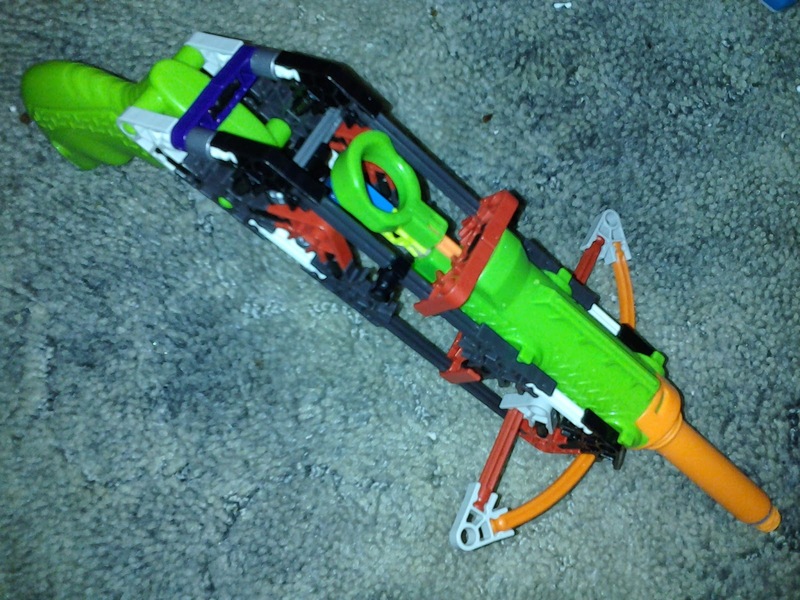 You'll note the uniquely molded dart heads, which weigh slightly more than their Nerf counterparts. In testing, these were fully compatible with Nerf clips and turrets. This was a better result than in testing done by Blaster Labs, which showed some jamming issues. 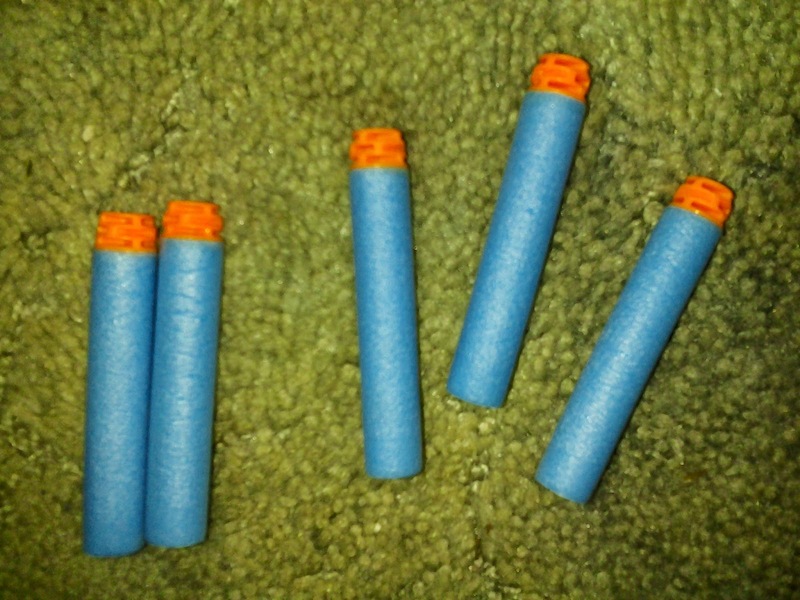 Perhaps the darts were modified slightly between testing then and production for store shelves today. In any case, I can confirm the extremely accurate and consistent performance that BL earlier noted. 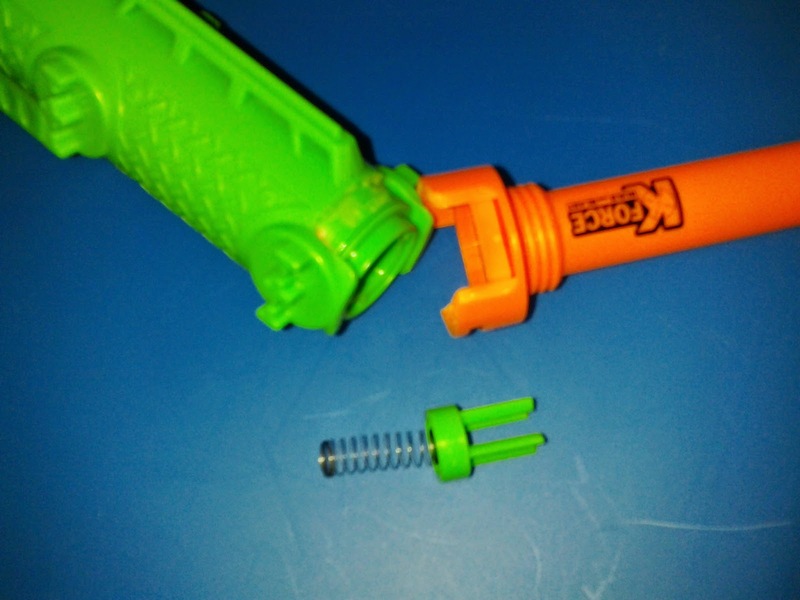 Firing out of everything from a Jolt to a modified Buzz Bee Big Blast with a foot-long, 9/16" brass barrel, the K'NEX darts flew right where you aimed them, without fishtailing or wild deviations in flight. Even at 100'+ distances with the Big Blast, you could reliably hit targets. These are by far the best stock darts I have ever seen, and should be the new standard in no time. Of course, a review wouldn't be complete without highlighting blaster performance. In stock form, the Mini Cross consistently shot at least 75' angled, matching the claims on the box. On average, my shots went 78'. With the removal of the air restrictor, (but no changes in spring or plunger seal improvements), average range rose to 87'. I had lots of fun with the Mini Cross, as well as the other models purchased. 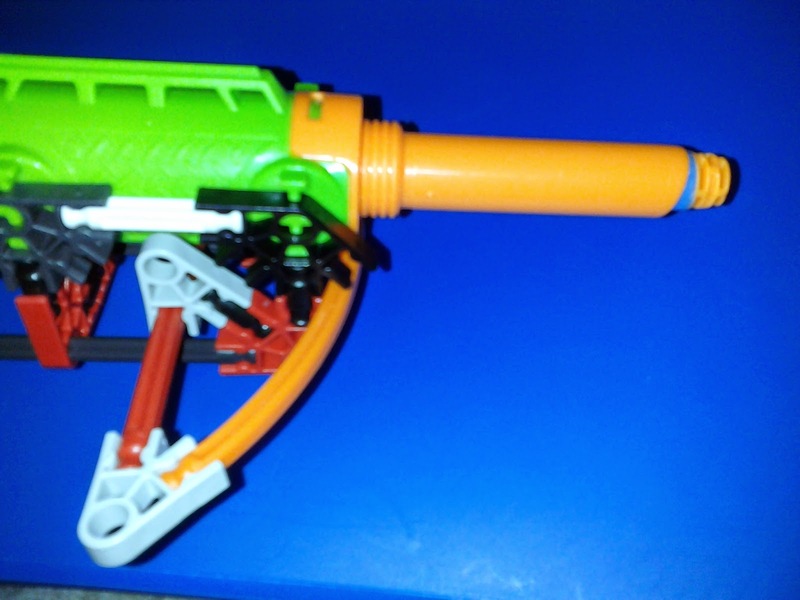 There's just something about making the blaster yourself that makes it more fun to play with afterward. And it helps that the blasters have great performance out of the box. 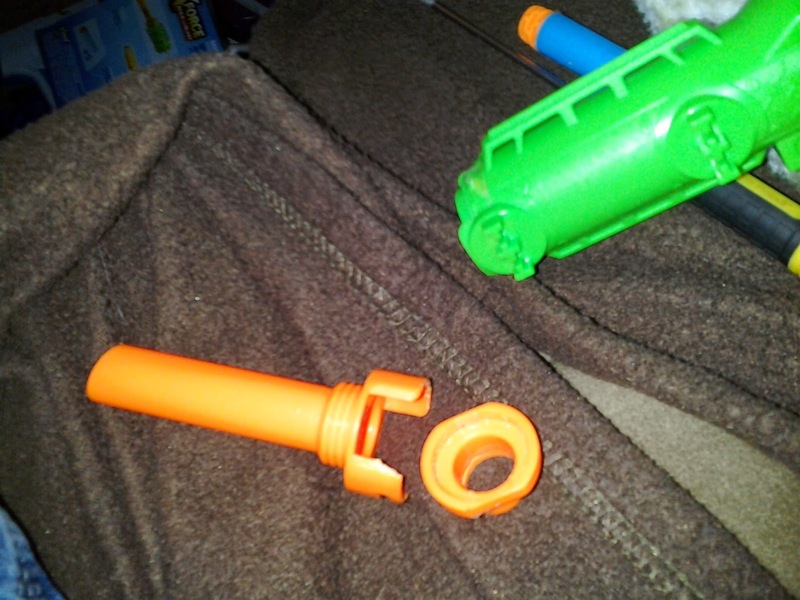 I have yet to test the blasters in a war setting, but running around and firing them at home has yet to reveal any stability issues with the building piece construction. The darts, meanwhile, are simply amazing, and they are worth purchasing by themselves if you don't care to get the blasters. This is an amazing new product line. 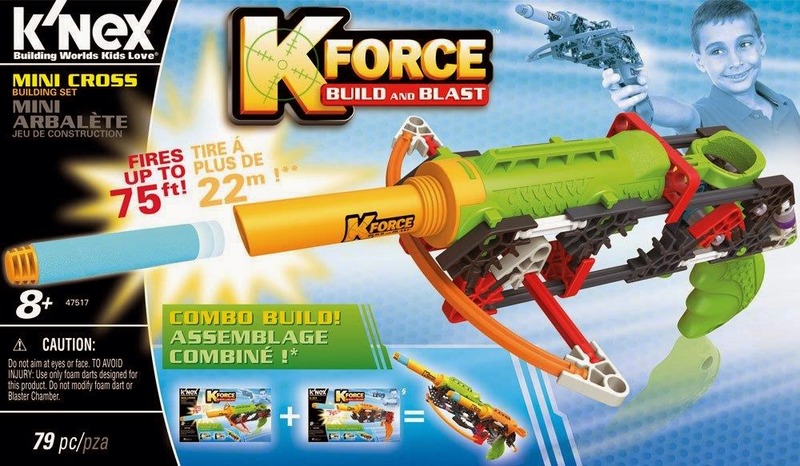 My only concern is the fact that they're on shelves with all of the other K'NEX sets, instead of near other blasters. While shelf placement makes sense, I fear that being away from other blasters will hurt awareness. At the very least, I hope that ToysRUs (who has exclusive distribution rights for now) will place the dart packs beside the packages of Nerf, BoomCo, and Air Zone darts. That would catch people's eyes and at least lead them to check the construction toy aisle. So glad to hear this review, Buffdaddy! I never owned a K'Nex set, but was interested in these and now even more. The company just continues to impress and do business right. Toys R Us declared bankruptcy if I am not mistaken. 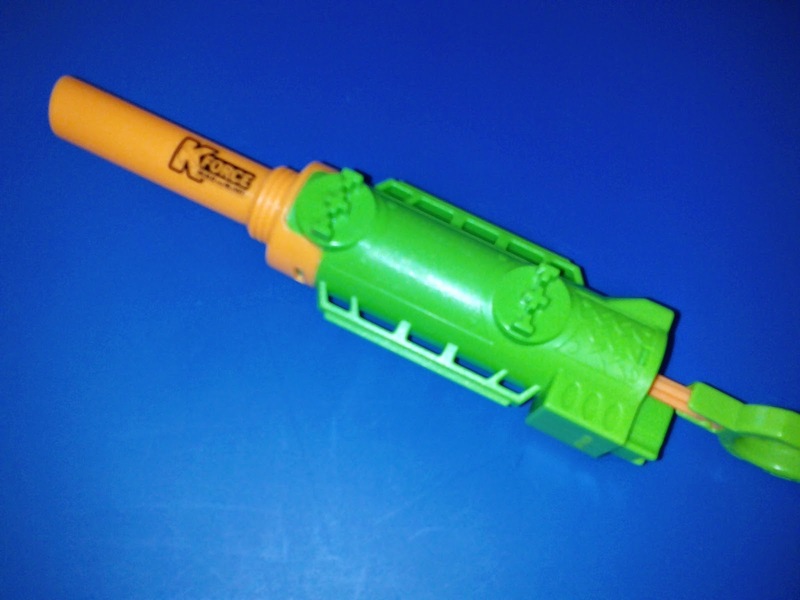 Any word on the effect this has on the Knex blasters? I assume another chain will grab the rights.